The life sciences is an industrial sector that covers the development of biological products and the use of biological processes in the production of goods, services and energy. This sector is frequently presented as a major opportunity for policy-makers to upgrade and renew regional economies, leading to social and economic development through support for high-tech innovation. 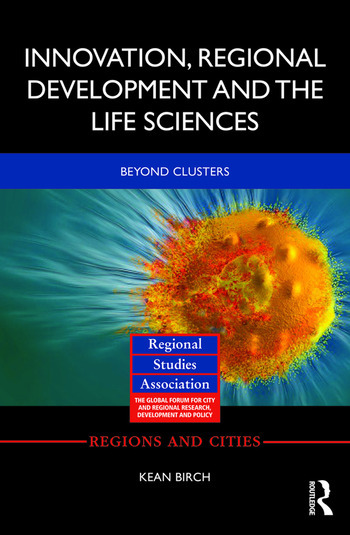 Innovation, Regional Development and the Life Sciences analyses where innovation happens in the life sciences, why it happens in those places, and what this means for regional development policies and strategies. Focusing on the UK and Europe, its arguments are relevant to a variety of countries and regions pursuing high-tech innovation and development policies. The book’s theoretical approach incorporates diverse geographies (e.g. global, national and regional) and political-economic forces (e.g. discourses, governance and finance) in order to understand where innovation happens in the life sciences, where and how value circulates in the life sciences, and who captures the value produced in life sciences innovation. This book will be of interest to researchers, students and policy-makers dealing with regional/local economic development. Chapter 1: Introduction: Knowledge economies everywhere! Chapter 7: Conclusion: Innovation and regional development for whom? Kean Birch is an Associate Professor in the Department of Social Science at York University, Canada.